This model kit, containing parts to build a model of ballistic missile submarine USS Ethan Allen (SSBN 608), was released in the early 1960s around the time of Ethan Allen‘s August 1961 commissioning. Ethan Allen was the sixth ballistic missile submarine (SSBN) commissioned by the U.S. Navy in the span of three years, and the lead ship of the Navy’s second class of ballistic missile submarines. 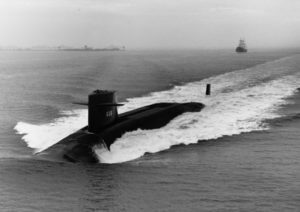 Unlike the five George Washington-class SSBNs that preceded her, which were converted from partially-constructed attack submarines, Ethan Allen was the first SSBN to be purpose-built to carry Polaris missiles. USS Ethan Allen (SSBN 608) underway, 1967. Ethan Allen and her sister SSBNs were the product of the Cold War arms race, a 46-year competition between the United States and Soviet Union to design and build increasingly sophisticated nuclear weapons. Both countries, fearing a nuclear attack from the other, subscribed to a strategy of deterrence: discouraging one’s enemy from making a nuclear attack by amassing nuclear weapons that could be used to retaliate. As the Cold War arms race produced increasingly powerful nuclear weapons, the threat of nuclear war invaded mainstream American culture. Movies and books painted terrifying pictures of nuclear annihilation, while newspaper headlines asserted and celebrated (perceived) American superiority. 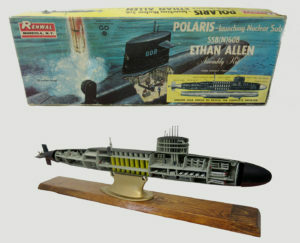 The instructions that accompanied the Ethan Allen model kit described the newly commissioned submarine as the “mightiest addition to the Polaris fleet.” Click image to enlarge. This model kit touted a highly visible technological achievement: the development of new submarines that carried nuclear ballistic missiles to deter a Soviet attack. Because deterrence strategy requires an enemy to know (and fear) your capabilities, promoting the new program helped increase its effectiveness. Marketing model kits like these to consumers also reassured Americans at home of America’s ability to safeguard its citizens.